First Line: It was as black in the closet as old blood. If you have an eleven-year-old sister whose passion is chemistry, it would not be wise to hogtie her and lock her in a closet. But if you're the older teenage sister whose own interests never stray far from your own appearance and romance, you may not realize that payback will be forthcoming... and a bit ugly. Once Flavia picks the lock and clambers out of the closet, already plotting her revenge, we quickly learn that: it's the summer of 1950; the de Luce family lives in a huge ancestral pile called Buckshaw outside the village of Bishop's Lacy in England; Colonel de Luce seems to live for nothing but collecting postage stamps; and his three daughters are pretty much allowed to do as they please. In Flavia's case, she spends a lot of time on her own in an ancestor's fully-equipped laboratory teaching herself all about poisons. (Just what you want every eleven-year-old to know about.) However, shortly after she escapes from the closet, strange things begin to occur. A dead bird with a postage stamp skewered on its beak is found on the kitchen doorstep. Then a very rude red-headed stranger has an argument with Colonel de Luce late at night, and mere hours later, Flavia trips over his dead body in the cucumber patch. Naturally Flavia's father is arrested for the murder, and the young girl is determined to discover the identity of the real killer. I avoided reading this book for a while due to the avalanche of press it received when it was first published. I knew that I did want to give it a try, but the more a book is touted as the best thing since sliced bread, the more I hesitate to pick up my butter knife. I did find the first-person narrative laugh-out-loud funny several times as Flavia described her adventures, and the mystery did have some meat on its bones so that it was not easily deduced. The characters in the surrounding small villages were quite well-done, too. However, Flavia's father and older sisters were too stereotyped-- and Flavia herself was a bit scary. Colonel de Luce needs to spend more time with his children and less time with his stamps. Flavia would welcome the attention, and it would keep her away from her Bunsen burners and lethal concoctions. 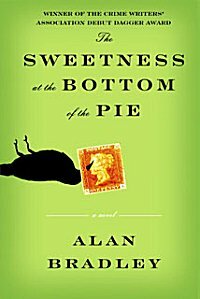 All in all, The Sweetness at the Bottom of the Pie was, for me, a fun, light-hearted way to spend an afternoon, but I failed to fall completely under its spell. So glad to see that you liked this one, definitely a great way to spend an afternoon. And wasn't she hilariously and scarily awesome? Cathy - I'm very glad that you liked it, even if you didn't completely fall in love with Flavia. I thought it was very funny, too. I have to say I liked the novel better than you did, but I'm glad that you found it enjoyable. I put this one off too, and only read it because it was the selection for the local mystery book club. I enjoyed it, but there was something about it that put me off, and I've never been able to put my finger on precisely what it was. I've read the second one and had the same reaction. Not sure if I'll bother getting the third one. That's the whole reason why I haven't picked this one up too. I'm hesitant because I know I'll probably have expectations that are too high. Amy-- However, every once in a while she was a bit too over the top for me. Margot-- I'm just not sure I found it enjoyable enough to try more in the series. We'll see! Bernadette-- For some reason, I think I'd give this one a miss if I were you. I'm having a psychic moment. Pepper-- Yes! Something put me off and I just can't pin it down! Alyce-- If it's a tried and true author of mine, I'll read it regardless of the hype. But for new-to-me authors I have to admit to waiting until the hubbub dies down. While I'm waiting, my expectations decrease as well. Completely agree with you of the portrayal of the family. They deserved to be more fleshed out (maybe in the others in the series?). There was one of the sisters (forgot her name), who reminded me of Mary in Pride & Prejudice and of which I'd like to know more about. Alex-- I can't remember her name either, but she reminded me of Mary Bennett, too!